Megumi lost. 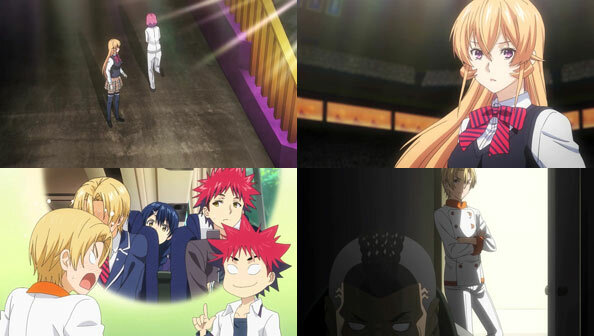 You knew she was always going to lose, if going by the spoilery OP that showed Kurokiba, Souma, and Hayama as three of the finalists. But it wasn’t a blowout by any means. While Senzaemon did not go shirtless, he did go loincloth-less, something he didn’t notice until getting up to leave. There’s veins of greatness within Megumi left to mine; she just didn’t mine enough to beat Kurokiba. 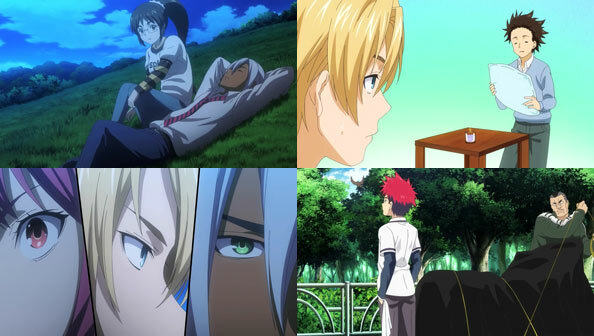 The OP also hints that Hayama will be one of the victors, and it only feels more likely when he rejects Jun’s assertion that he’s already made her proud by advancing past the prelims. Arato Hisako also pledges to win for Erina-sama, while Takumi vows to defeat his foe for his brother’s sake. All have people they love whom they don’t want to let down. But at least one of them will; two if the fourth guy wins. Who is the fourth guy? The huge motorcycle punk Mimasaka Subaru, who finally introduces himself to Souma. Rather than give him a ride to the arena, he locks up his bike right there and they continue on foot together. His bike-locking procedure, like everything else he does, underscores his obsessive attention to detail, which belies his appearance. SnS actually switches things up by not having the arena audience and judges be the only spectators. 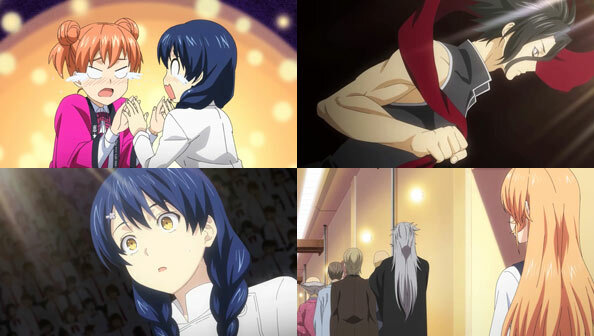 Mimasaka warmly invites Souma, Megumi, and Takumi to his standby room to watch the fight, and we learn more about him by watching his reactions to the match between Hayama and Hisako. While the former tends to an impressive cylinder of doner kebab, Arato seemingly pulls out all of her medicinal stops by using every bit of a Chinese soft turtle (or suppon) that she personally butchers on the spot (exciting Nao) without flinching to craft a very inventive hamburger. I say “seemingly” since throughout her cooking, she aspires only to walk “close” to her beloved Erina, “following a few steps behind.” In essence, she’s conceding the top spot to someone else, which is certainly reasonable considering Erina’s talent; but it’s not ambitious enough. Hisako’s burger is creative, beautiful and delicious; it excites both the taste buds and the soft palate with its exquisite texture, and it also restores vigor by right of being crafted with her extensive knowledge of Chinese medicine. It even sends Senzaemon into rapture, as he imagines a Godzilla-style Hisako turtle monster roaming the streets; he growling noise she makes while doing so is fantastic. Perhaps Hisako’s largest flaw in her dish is the ever-important “pickles” component. She used ginger and ginger alone; Hayama made achaar with onions and a dozen other ingredients to create a pickle unlike any other that made what looked like a heavy, overbearing meat-filled bread pocket into something the judges salivate for like ravenous dogs and inhale just as quickly as said dogs. Miss Secretary created a dish that doubles as lunch and medicine, but the Sultan of Spice hijacked the basic human instinct for food and blew it up. Even Hisako herself realized she could not win against that. Hayama twists the knife by calling Hisako’s goals and cooking “too small”, and she rushes out of the theater, straight past Erina, the number one she never considered trying to supplant. That takes us to the next match: Takumi vs. the Mimasaka guy. Like Yuki in Momokuri, Mimasaka has been stalking Takumi and knows every last detail about him. Because of that, he knows how to get under his skin: by badmouthing his brother. 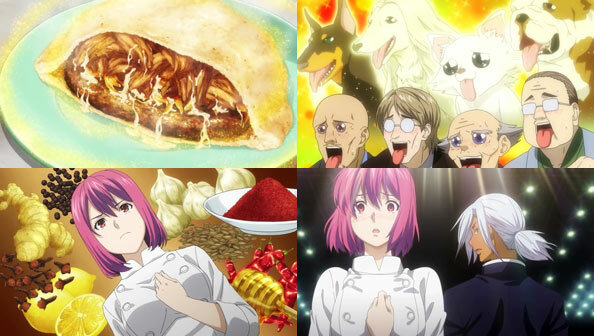 It works, and the match becomes a Shokugeki, the winner of which is not clear from the OP (at least from what I saw). That’s fine; whether or not an OP spoils things is beside the point; what matters is enjoying the battles and watching how one chef’s unique skillset and style beats another chef, not necessarily which chef will win. I entered this episode with an empty stomach, and like many other episodes before, took basic culinary knowledge I was aware of and took it further, demonstrating new and exciting methods and combinations of flavor. Now that it’s over, I really do need to eat something.